Do you know what this flower is? The only clue I will give is that this is a trick question. Last evening just before sunset but after the bright light of the day was gone, I stepped outside the cabin to look around. The birds had gone to roost already, so I didn't hear their songs. I knew that something was different, but for a few seconds I couldn't put my finger on it. And then it dawned on me. I was hearing the sound of leaves rustling in the slight evening breeze. I haven't heard that sound since sometime last fall. The sound of fall leaves rustling in the breeze is different than the sound of spring's leaves. By fall, the leaves are drier so the sound is more papery. The sound of spring leaves rustling is almost a whisper compared to the sound of fall. The spring leaves are full and moist but they still rustle in the breeze. This spring's explosion of leaf growth has happened more quickly than is usually trypical. The sound of spring leaves usually creeps up on me and doesn't happen all at once. This year, though last night's breeze was but slight, the leaves are already talking to each other and to me. Overnight more warblers arrived around the cabin. This morning I saw and heard black-throated greens calling and flitting through the trees. There were likely more species than that. I just hope they will still be around this evening. April is bustin’ out all over. Wait. No, that’s not how it’s supposed to go. Well, supposed to or not, that’s what’s going on here at Roundtop this morning. The leaves aren’t unfolding, peeking out or even developing. They are exploding into being. Not only can I see changes from day to day, I can see them from morning to night. And if I was home, I expect I could see the change from morning to noon and again from noon to night. Yes, Virigina, there is global warming. The forest around me looks like it does in mid-May. Late April isn't normally this lush. This morning I’d no sooner stepped off the deck and looked up towards my ever-shrinking view of the sky when I saw an osprey heading north. Seeing an osprey at 7 a.m. is unusual, though it shouldn’t have been a complete surprise. Osprey often migrate into the evenings until it is too dark to see them. I’ve stumbled off Hawk Mountain’s North Lookout enough times to know that. Seeing them so early in the mornings isn’t as common but osprey do seem to be one of the raptors that is less averse to twilight flights. The red foxes were also out and barking this morning. I’m pretty sure they have a den not far from the cabin. The barking was quite close and was answered by the second fox just on the other side of me. When Dog and I walked this morning, he suddenly got very excited when we passed one section of the lane, and I would almost bet that’s where the second fox crossed as it headed back to the den after a night’s hunt. I suspect the den is near a seasonal stream just below the cabin, perhaps 75 yards away. The area is rocky and sheltered by a riot of undergrowth. 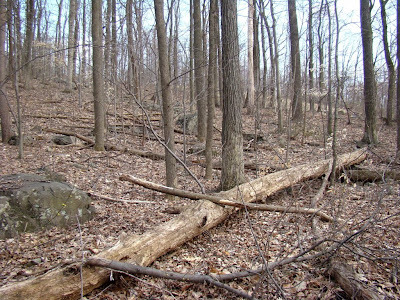 Downed trees of various sizes make entering the spot virtually impossible. Some weekend day soon when it’s not raining, I’m going to find a spot to sit where I can observe the area and see if I can prove if my guess about their den is correct. 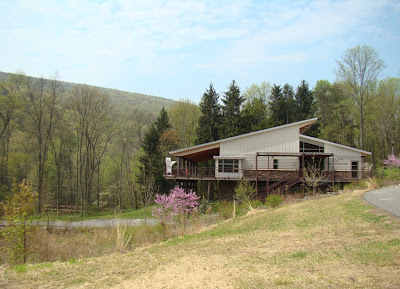 On Saturday I visited the Ned Smith Center for Nature and Art, just outside of Millersburg, Pennsylvania, where I took a 6 mile walk along the trails there. Ned Smith was one of Pennsylvania’s best-known artists. 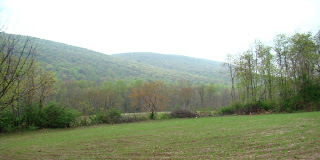 He specialized in nature and the outdoors and was for many years the artist for the Pennsylvania Game News, which is where many people saw his work every month. He also created artwork for many national outdoor magazines. Ned Smith was a gifted writer, and his book Gone for the Day, a field notebook illustrated with his pen-and-ink drawings, is still in print. After his death in 1985, land along the Wiconisco Creek was purchased and eventually the center was built. Today, the center is a haven for both outdoor education and recreation, and the gallery houses many of Smith’s paintings and sketches. 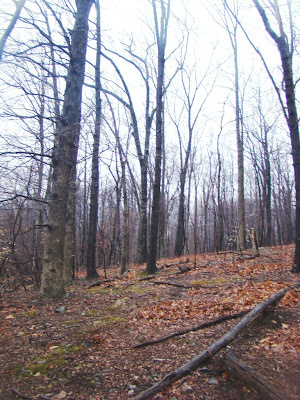 It sits on more than 500 acres and has over 12 miles of trails. Saturday was one of those moist, almost dreamy, April days where spring growth seems impossibly lush, and spring warblers flit from tree to tree. Fly fishermen plied the creek, while birders haunted the edges, eyes turned upward into the trees. In other words, it was a perfect day to get out and walk. 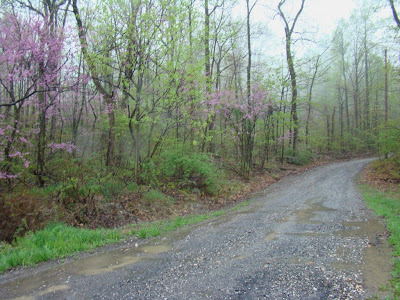 The center is about 40 miles northeast of Roundtop, and my first thought as I headed down a trail was that spring looked further along up here than it seems back on my mountain. Perhaps the Wiconisco Creek, which runs just below the center’s headquarters, helps hydrate the plant life more than is possible in the drier landscape of Roundtop. The flowers and plants I saw here were much the same as the ones back home, but they were larger or further developed. For example, the violets here were in full bloom, while back at home, the blooms are just opening. As I walked above the creek, I soon heard wild turkey, pileated woodpeckers, phoebes and towhees, just to name a few. 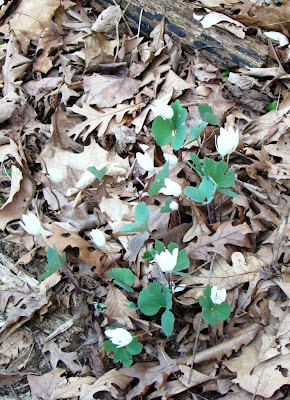 The forest was thick with rue anemone, ferns, violets and lovely, well-marked trails. I looped around a trail that was perhaps 100 feet above the creek, then I headed down to the creek itself. It was along the creek that I saw the most people, fishermen and birders both. I followed the path of an old railroad bed for a while, found a side trail that wound through hemlocks and reached a small rill that rolled into the main creek. I walked another trail that headed very sharply straight up the side of the mountain, had to pause for breath more than once and was very glad when the trail turned and headed along the mountain. The trail turned again, this time to head straight down the mountain, and I was forced to inch my way slowly back down on a carpet of slippery leaves and hidden rocks. Returning to flatter ground again, I walked a trail that headed out of the woods and along the nearby fields, but providing great views back towards the mountains. I looped back to the center and visited the gallery and the shop. I headed home a bit reluctantly, wishing the center was closer in both miles and travel time. I found the visit and the center rich with possibilities, the kind of place that would be wonderful to visit regularly throughout the year. 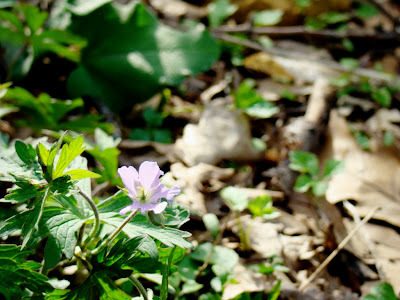 Wild geraniums are common as all get out here in the woods of the eastern U.S., but don't take that to mean I don't like them. They are also one of the prettiest of the native flowers. I'm simply reporting how common they are because if you're reading this from somewhere in the eastern U.S., you can probably find them just about anywhere you can find woods near you. The plants are small, though, so they don't jump right out at you. Wild geraniums are often found with or near mayapples, which are larger and easier to see, and which is where I found this one. I've looked at a fair number of photos from other places around the east, and the color of the geranium varies a lot from blue to deeper purple, to my pale lilac shade. They are not supposed to ever be white, though. The leaves are heavily toothed. It's another big migration weekend here at the cabin. I've heard the first wood thrush, seen blue-headed vireo and black-and-white warbler. The black-and-white warbler is a bit of an oddity. They prefer conifers, and I don't have many of those here in the oak forest. Of course it was just passing through. The arrival of the wood thrush is only a day or so later than average. I still have only heard one and I haven't yet heard or seen an ovenbird, which usually arrive on the same bus with the wood thrush. Maybe today. What a difference seven days makes! Last week my Thursday night experiment looked little different than it had looked the previous three weeks. I had to traipse through greenery last Thursday to get to my patch, but once I got there it looked like the woods that spring forgot. This week, my exploration of how the forest changes from winter to spring really looks like spring. As you can see, I also have a new variable in this week's photo. It's Dog. This spring is starting to feel a little odd to me. I haven't found tree or barn swallows here on the ponds of the mountain yet. I usually have the first wood thrush and ovenbirds around this date, too, and they're not here. I do have a healthy crop of yellow-rumped warblers but have yet to see a single warbler of a different species. The Canada geese do not seem to be sitting on their nests yet. Everything just seems a little off, though not yet to a critical degree. It is dry here, despite a little rain last week, so perhaps that is a factor. Some other nearby areas got quite a lot of rain; a few miles to the east they had almost nothing. I had a little but judging by the way the leaves disintegrated under my feet last night, the forest is still pretty thirsty. The second photo I'm posting today is the one from last week's experiment. It's quite different, isn't it? I wonder how much it will change by next week? It’s been a busy morning for the animals around the cabin. I can go some time, days certainly, without any really unusual sightings and then suddenly in an hour or less, I’ll have several good sightings. When that happens, I always get suspicious. Is the weather about to change? Is there some kind of threat nearby to move the animals from their normal haunts? This morning my suspicious nature needn’t be awakened. My first sighting was of a Cooper’s hawk, likely one of the many migrants passing through right now. It was sitting on a low bush, surrounded by screaming blue jays, all outraged by its presence. I suspect the bird roosted here over night and will be prompted to keep moving north by the jays, if nothing else. I also saw a red fox dash in front of me this morning. I don’t think it was one of my regular pair of foxes, though this one was also a beauty. This fox was large and healthy-looking and appeared to be all red with no black points at all. Red foxes are somewhat variable in their shades of red. Some are bright red. This one seemed to me to be a sandier red than is average. The forest around the cabin continues its riot of blooming. 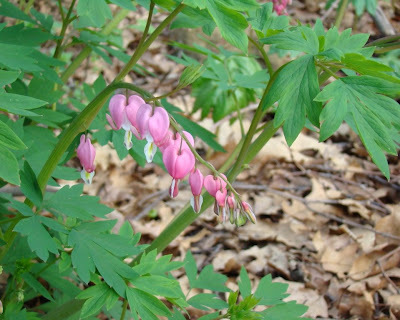 My bleeding heart bush is another that has started its annual round of blooms. The plant is native to Pennsylvania, but this is a bush I planted 3-4 years ago. Each year the bush grows larger, and it blooms for some time, though by August the bush will have withered and turned to yellow. For some reason, I always worry that it’s not going to make it to the next year, but so far it always has. Redbud is starting to show color around the cabin this week. It’s still several days from its peak show of color, but I couldn’t wait until then before taking my first photos of it this year. I find redbud to be kind of a contradiction. It’s a beautiful tree when it’s in bloom but is something of an eyesore when it’s not, which is approximately 51 weeks out of the year. In fact when it’s not in bloom, it’s often mistaken for something that needs to be removed or thinned out. It doesn’t have a distinctive trunk or even an attractive shape or even much of a standard shape at all. It loves to grow in places where other things don’t like to grow, like between these rocks, or it grows where the other things that grow around it are brambles and other undesirables. 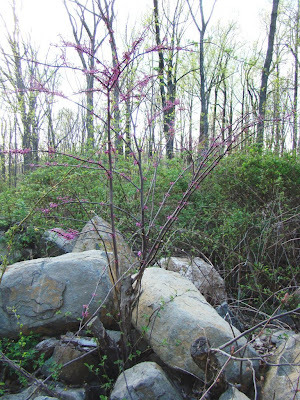 Perhaps because redbud shows its color at roughly the same time that dogwood trees bloom, many people think the purple color of the "red" bud is also a flower. It’s not. It’s really the leaf bud that will simply grow into leaves. I also find redbud difficult to photograph. It’s easy enough to get a close up of the buds, but when you pull back and try to show the entire tree, the color blends in with the scrubbiness of its surroundings and isn’t nearly as striking. Or so I find it. Perhaps in another few days when the buds are a bit larger and more of the trees are coloring along my lane, the effect will be more striking. The forest’s marcescent leaves are finally starting to come down. Some of the younger beech trees held onto their leaves the longest but even those are now starting to fall. 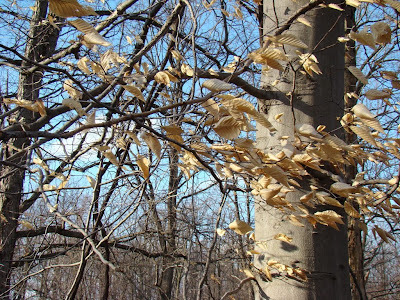 This means the beech trees will soon produce their new leaves for this season. For the past few days, before the marcescent ones began to fall, the forest looked a little odd. Some trees were pretty well-leafed out or at least well-budded but others still held onto last year’s dead leaves. It looked like two seasons on display at the same time. Even in today’s photo, you can see the green shades in the forest behind this leaf. I am noticing big differences in spring growth between what’s going on around my cabin and what’s leafed out down off the mountain. 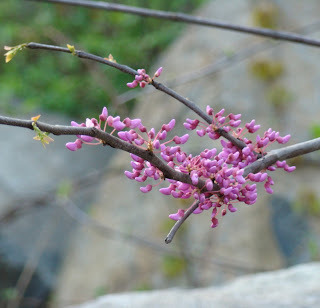 Off the mountain, the redbud is in full bud, but up where I am, the color on the buds is just beginning. 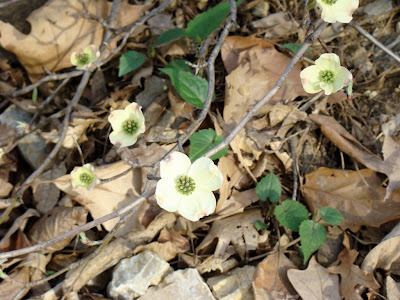 The dogwood is much the same—very pretty down in the valley but still early on up where I am. And "up where I am" isn’t all that up. I live at about 1000-1050 feet above sea level, while the valley is around 300 feet above sea level. It’s not as though the altitude is profoundly different between where I am and where most people live, but it is enough. It is different enough in other ways, too. And for that I am thankful. I have lived up here long enough that I don't think I could go back to living in the valley again. That I don't ever want to goes without saying. I have reached the point where I routinely wonder how anyone can live where nature is held at bay with lawns and box stores and highways. I am sorry to be the exception rather than the rule. Truly, "up where I am" is where I want to be. 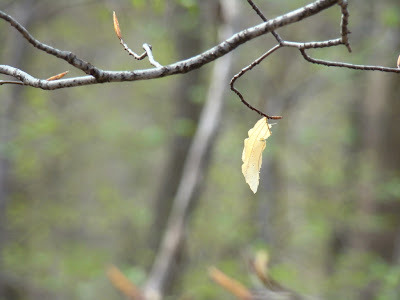 But sometimes I feel a bit like a marcescent leaf myself--the last one, still hanging on. Bloodroot sends up a lovely flower, but it’s really just a one-day wonder. More than 20 flowers bloomed on the mountain in one small spot on Friday and Saturday. This Monday morning they are gone already, the pretty white petals littering the ground below the stems. The plants are blooming a few days earlier this year than last year, when I noted them on April 25. Bloodroot was used by native Americans to make red dye. I’ve never dug one up or tried to make dye from them. I’m always impressed when I read about various plants and their uses, medicinal or otherwise. The trial and error that must have gone into discovering how plants can be used is mindboggling. The first yellow-rumped warblers have arrived. Saturday morning I was up early and diligently went in search of them—to no avail. It seemed like the perfect weather for warblers to arrive, too—grey and overcast with a moist air and lots of bugs. After an hour or so I gave up and went inside. An hour or so later I stepped outside, immediately heard a familiar little buzzy song and there they were. Who knows how many there were, perhaps 8-12, tiny flits of color 75 feet up in the top of the oak trees. Even with 10-power binoculars they don’t fill the field of view. Roundtop isn’t the best spot for warblers, though sometimes it is quite good. From what I can tell, the warblers first come to ground on the top of the mountain and then work their way down the sides, eating as they go. I’ve never seen them working their way up the mountain. Perhaps that’s why I don’t see them in the early mornings. In the early morning, perhaps they are still resting and eating on the top and it isn’t until mid-morning that they move downhill where I see them. The photo today is my latest "experiment photo," and I have to say that it still doesn't look a lot different than it did 3 weeks ago. I find it odd that this little patch seems to be the part of the forest that spring forgot. I had to walk through lots of greenery to get to my spot, but in the spot itself, spring isn't very far along. Not 50 feet away from the experiment spot, the first of the dogwood is starting to bloom, and the redbud is starting to look red around the edges again. A little wild cherry has one or two blooms on it. The bloodroot is now blooming. Yesterday those blooms were spectacular. Today, the petals on one are already falling off. I expected to see more migrant birds this morning, especially a few warblers, as I wandered around, but I didn't. The ruby-crowned kinglet is still here, but so are the white-throated sparrows. I didn't see any juncos but the phoebes, robins, bluebirds, titmice, etc. are in full voice. Perhaps I'll find warblers tomorrow. I'm pretty sure this is round-lobed hepatica. I found this plant last night as I was wandering in the woods. 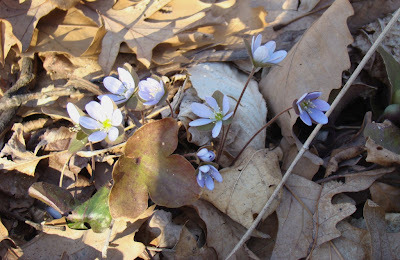 I say I'm pretty sure because hepatica are pretty variable--white to pink to deep purple. Also, the leaves, which really help to identify a flower, don't appear until after the flowers bloom. Hepatica are a flower of dry, rocky woods, and that really suits my forest right now. Well, the rocky part is true all the time. But right now the forest is exceptionally dry, even more so when I consider that it is after all spring and is therefore supposed to be wet and rainy. My wandering in the forest was more of a crunch, crunch, crunch. I hadn't realized just how dry it was until I crunched my way through the leaves and undergrowth, photographing various flowers and may apples and studying leaves just poking up through the dry leaves. The leaves sounded the way that delicate crunchy paper does when you crumple it. Jennifer of A Passion for Nature has pointed out that the flower I called a spring beauty two days ago is likely a rue anemone instead. I think she is likely right. I also have wood anemone, which has not bloomed yet. In this area wood anemone is usually just called anemone, and I was sure the bloom I had was not that. Also, my flower is slightly pinkish, though that doesn't show up well in my photo, and I thought that was a dealbreaker in the identification. I also want to bring to your attention that the new issue of I and the Bird (#73) is up. This month's festival is hosted by Snail's Eye View. Snail has as her theme the diary of Samuel Pepys, and it works very well! 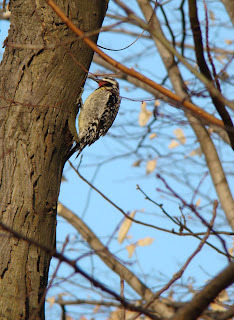 My post and photo of the yellow-bellied sapsucker is also included. Last night I traveled off the mountain and down into the valley below me and was surprised to see how far along spring has progressed down there. I saw grass that was green, skunk cabbage a foot tall, and the trees almost in leaf. Where I live, the mayapples are just poking through the ground, and the trees are barely in bud. But wherever I was, it was a beautiful day and a beautiful evening. 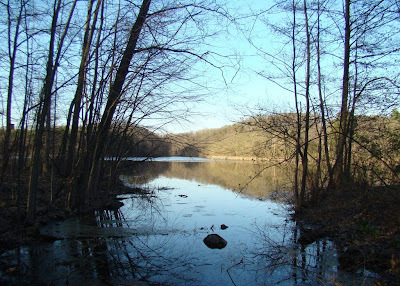 Today’s photo shows a perfectly still Pinchot Lake at day’s end. Yesterday was the kind of day that I know was a huge migration day, but I’m kind of glad I didn’t spend all day on a hawkwatch staring into that perfectly blue sky. My eyes hurt just thinking about it. The hawks would be almost invisible, not to mention tiny, against that unending blue. This morning looks as though it might be a repeat of yesterday, which could mean that hawks and songbirds will simply overfly my mountain this spring on their way north. It’s better for me and my birding when the weather is poor and the birds are forced to find a spot to wait it out for a day or so. It’s not better for them, of course. What I can see this morning on the mountain is that the bloodroot flowers are not yet open but the petals are not as tight as they were yesterday. At first, I thought this flower might be blooming during the hours I’m away from the cabin and closing up when the sun is no longer on it. But when I got home last evening, the sun was still on the flowers and they were still closed. So the blooms will wait for another day or two or three. The first of the spring beauties are up and blooming around the cabin. 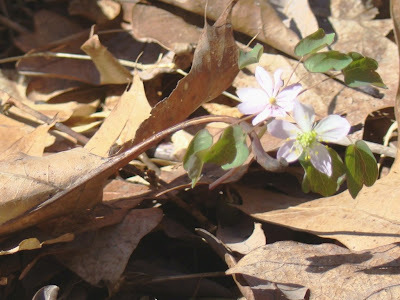 The one in today’s photo is the Carolina spring beauty (Claytonia Carolina). I usually have the other spring beauty (C. virginica) too, but I haven’t seen that one yet. The two are very similar, and for me the best way to distinguish them is by the leaves. The leaves on the Carolina are roundish, as you can see here, while the end of the leaves on the other one are pointy. At the moment, spring 2008 is just slightly ahead of spring 2007. Last year’s first spring beauty photo was posted on April 17. I’ve discovered that blog labels are an excellent and fast way to facilitate keeping track of such things. Keeping track of the first this and the last that, especially in this era of global warming, should, eventually, offer fairly immediate documentation of the changes. Likely everyone else discovered this fact years ago, while I am only now realizing how nicely that feature can be used. I haven’t always been so diligent with my blog labels, though, so I’ve started going back through my archives and updating them. Bloodroot is also about ready to bloom. I’ve expected to see the blooms open for the past three days, but so far they’ve all been closed during the hours I’m at the cabin. Migration has slowed again here on the mountain. The winds have been from the northwest the past two days, and since birds heading north don’t much care to fight headwinds, they are likely sitting tight and waiting for more favorable winds. I’ve had frost the past two nights, and I think that is what has temporarily quieted the spring peepers. Still, even with the chilly mornings, the new season has now progressed to the point where even with frost in the mornings the days still feel like spring. Migration and spring took a big step forward on Saturday. The day was warm and felt moist. A small thunderstorm passed through Saturday evening. I found the first Trout Lily (or Dog-toothed Violet or Yellow Violet). In the photo of this tiny little flower you can see why one of its common names is dog-toothed violet, which is the name I hear most often for it. The individual petals of the flower are about the same size and shape as Dog’s canine teeth. I like how the photo makes the flower look as though it’s deep in some forest meadow. The reality is that it’s right at the edge of where I park the car, and I have to be careful not to back up too far and crush it. This spot is thick with the pretty two-toned leaves of this flower, but so far just the one flower has bloomed. Saturday was also a good day for bird migration. On Friday, the first ruby-crowned kinglet arrived. On Saturday, I saw a dozen or more of the tiny birds, mostly females, though I did see 3 males. They flitted all around the cabin. Chipping sparrows have also arrived now, the first of millions—at least that’s how it seems. In summer if I see 100 sparrows, 99 of them will be chipping sparrows and the 100th will be a song sparrow. I wish I had the time to spend a full day just sitting outside and watching what goes on around the cabin. But a little time here and a little there is all the time there is. Yesterday was a big day for spring migration around my cabin. You won’t find that surprising after I tell you that it’s been grey and gloomy for the 8 days before yesterday and today is already grey and gloomy ahead of storms that will hit later on. Yesterday, however, was spectacular—perfectly clear and warm with little breeze but what there was of that came from the south. In other words, it was really prime for migration, the single good migration day sandwiched between overcast, foggy, rainy or stormy days. So yesterday evening, I decided to take advantage of the good weather to see what I could. I grabbed a chair and parked myself with my binoculars out in the driveway and just sat. It didn’t take long. First, three red-tailed hawks circled over the trees, screaming at each other but looking content enough as they kettled in the thermals. Then I saw a pair of cormorants, soaring not flapping, which I don’t think I’ve ever seen them do before. They were quite beautiful, and not that high. I had to look several times to convince myself they really were cormorants because of the soaring flight pattern, but I was convinced. Two birds I wished I didn’t see also made an appearance—a pair of brown-headed cowbirds. These birds don’t build their own nests, they just lay their large eggs in the nests of other, smaller birds, and the true offspring of those nesting songbirds usually end up dead—pushed out of the nest by the large baby cowbirds. For a while I was joined by a ruby-crowned kinglet, another first for the year. This bird plied the low branches that line the driveway and seemed quite unconcerned that I was nearby, even when it was only 6-10 feet away. Last year my first sighting of this species was April 14, so its timing this year is on schedule. It was a lovely evening, one to be savored, as it will be a while before the weather cooperates like that again. My photo today is part of my spring experiment of tracking how vegetation takes over once winter ends. It’s been two weeks now since my original photo. So far, the forest doesn’t yet look very spring-like, except for two things. On the left, which might not be visible in the smaller size of this photo, I can see a few green buds on the shoots of a shrub and the moss on the rocks is definitely greener than at first. This morning has already brought me a multitude of spring surprises. Isn’t that just like spring? Days go by where nothing much happens and then bam!—everything happens at the same time. But let me back up just a little. The first of the spring surprises actually started last evening. Last evening was warmer than the windier midday hours, and I was enjoying that, walking up and down the front forest, just checking out the progress of the spring growth. It was not much different than it had been in the morning, and I was about to head back into the cabin when I heard the song, "Drink your teeeaaa." Well, I don’t think that’s what they really sound like, but that’s the accepted mnemonic. To me it sounds more like "Sink or swiiiim" but that’s just me. In any event, the first eastern towhee was now calling in my edge of the forest. This is actually a late first appearance for the towhee. In 2006 my first sighting was the end of March. Last year the first appearance was April 4. Perhaps the dismal weather of the past week detained them. The rest of the spring surprises began right away this morning when I first saw the clouds had finally cleared overnight. So when Dog and I started our usual 5:30 a.m. walk, the morning was noticeably lighter than it’s been so far this year. After more than a week of overcast skies that kept our early morning walks as dark as winter, this difference is a welcome change. The dawn chorus of singing birds was loud this morning, the first time I can say that this year. Oh, the chorus has been present for weeks now, but it hasn’t been loud until this morning. This morning it was loud. I heard several towhees, not just the single one from the previo us evening; plus cardinals, titmice, phoebes, a great horned owl, the ever-singing robins, juncos, song sparrows and the mockingbirds, just to name a few. This particular mockingbird, by the way, does a great mallard alarm call that is good enough to put this impressionist on Jay Leno. And then it’s almost time for work. I’d even loaded up the car when a sapsucker flew right past me. 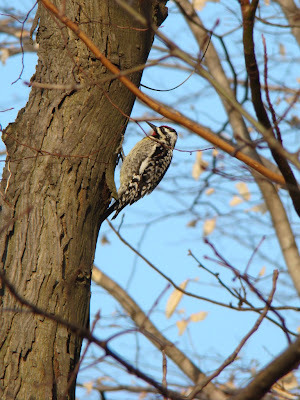 A yellow-bellied sapsucker! They are uncommon in my woods, and it’s typical for me to have only a few sightings each year. Even those are most typically younger birds in December who just can’t quite work up the nerve to migrate yet. Interestingly, though, last year I had a sapsucker sighting on April 8, so the timing of their migration in both years is apparently much the same. I started to try and take photos of this bird, but it wasn’t very close, bouncing from tree to tree. I zoomed in a bit and hoped I could zoom in even more once I got the shots in a computer. Then the bird flew a little further away, and I figured the morning’s unexpected event was over. I was putting the camera back in its case when the bird suddenly flew towards me and proceeded to hammer no more than 20 feet away, closer than it had been throughout this entire sighting. And this time, it was close enough for a few good shots before it flew off again, this time for good, deeper into the forest. I can hardly wait until I get home tonight and see what the rest of the day brings. Spring starts in the small details--a warm smell to the air, the sound of spring peepers after sunset or tiny green buds along a brown branch. Today, the first buds are added to my sights of spring around the cabin. Sometimes spring starts with a bang—that was last year when a late cold spell held spring at bay for weeks. When winter finally did relent, spring exploded all at once. This year, so far at least, spring is appearing one detail at a time. Each new day brings a tiny new thing to the forest. In the evenings, I walk up and down the driveway or wander out back, searching for something that looks different than it did the day before. The changes I find are subtle ones, tiny ones, but they are there. Bird migration seems to have stalled over my piece of the forest. I have yet to see fox sparrow or hear a towhee. I was astonished to read the reports of good numbers of migrating hawks along the eastern Great Lakes already. I have seen none of that here yet. Here, the grey weather has yet to bring April showers, though the weather threatens every day. I am starting to long for a little sun, but the grey clouds are as unrelenting as last year’s spring cold snap. This week, perhaps because spring’s progress has stalled a bit, I’m taken with exploring the texture of bark on the trees of the forest around the cabin. This one is white oak. It’s a good-sized tree, likely 75 years old or more, one of many of a similar size around my door. 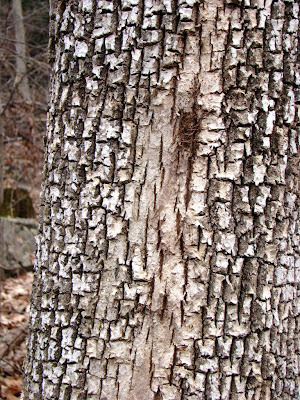 Each tree species has its own particular bark pattern. I know most tree species by their leaves but I’m still learning the bark patterns. As with anything, the most distinctive ones are the easiest to learn. 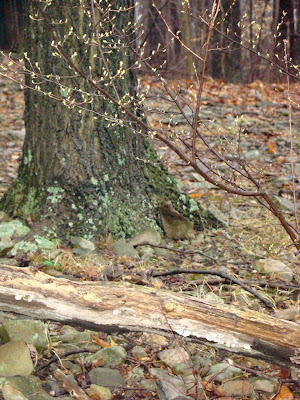 The bark of the American beech is smooth and gray in a sea of brown. The bark of the wild cherry has horizontal stripes. The name shagbark hickory is a good description of that tree’s bark. "As long as I live, I’ll hear waterfalls and birds and winds sing. I’ll interpret the rocks, learn the language of flood, storm and the avalanche. I’ll acquaint myself with the glaciers and wild gardens, and get as near to the heart of the world as I can." And perhaps that’s what I’m trying to do, though without the poetry of Muir’s words. When I first moved to my cabin in the woods, I saw what most jumped out at me—birds, mostly. Later, I learned what tree species were in front of my door, and I learned their leaves. Now, I am going deeper, learning the trees by their bark and flowering plants by their leaves before they flower. I am getting closer to the heart of the forest. Every day, there is something new to see, something new to investigate and learn about. What I learned last year or the year before that is no longer good enough or deep enough or even just enough. And knowing that I will never reach the end of what there is to learn is somehow very rewarding and comforting to me. A lifetime will not be enough, nor would 12 lifetimes, but that’s okay. Today’s photo is a coltsfoot flower, the first flower in my area in this or any other year. 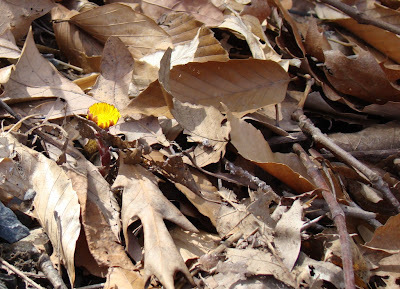 Coltsfoot is so anxious to bloom that it pokes its yellow head out even before its leaves appear. This year, the flowering is right on schedule, blooming as it usually does the first week of April. Last year the bloom was late because of a severe cold snap during late March and early April. Except for this single coltsfoot flower, spring didn’t move forward very much this past weekend up on the mountain. The weather is grey and gloomy, with only momentary appearances of sun or blue sky. It has been that way since the middle of last week. It is still that way this morning. I went birding on Saturday morning but have no new spring residents or even new non-residents to report. 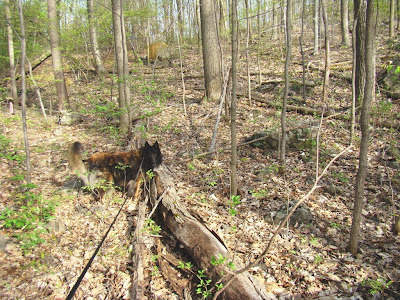 The spring growth on the forest floor is a little higher every day but only a little. 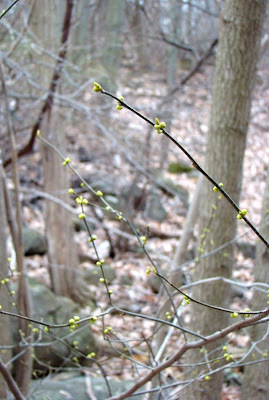 The trees are not yet budding, though the leaves of a few shrubs are close. Yesterday, the cats were entranced with the sight of a squirrel ripping the leaf buds off what I think is a wild rose shrub. The bird feeder was full, so presumably the squirrel was just looking for a fresh "salad" after a winter of seeds and nuts. It feels as though spring is taking a bit of a breather right now. After the giddiness of its first appearance, nothing much visible is going on right now, though I expect the plants are all stretching in the soft earth, their roots waking up. Just because I can’t see anything new right now doesn’t mean spring isn’t going on underneath the surface of my feet. 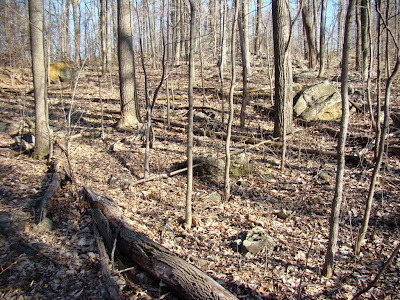 I took photo #2 in my experiment (see entry of March 26) of seeing the changes in the forest as spring progresses. It’s been exactly a week since my first photo. So far, I can see no differences that I’m sure of. It’s possible the moss on one of the boulders is brighter and greener, but it’s also possible this is because the second photo was taken in a moment of sunshine and the first was taken during an overcast sky. Spring changes everything—again. Even the most familiar of landscapes suddenly looks different and new. Today I am struck by the textures and patterns of the forest. Moss and lichens are suddenly multi-colored. Even rocks that have the same makeup each have their own, slightly different shade. The bark of each different tree has its own feel. Each brown leaf is a different shape. The differences are all in the nuances. It is into this currently nuanced landscape that spring suddenly appears with its riot of change. Soon greens will dominate and even overtake the browns, and every other color, from red to white to blue will also make a mark. It is a wondrous thing to watch happen, this miracle of spring. Sometimes, in my excitement to see new migrants or the first forest babies, I ignore the changes to the forest itself. Sometimes, I pay more attention to forest residents than to the forest that is our home. Today, this spring, I’m trying to change that habit. I want to see the forest--and the trees. The rain cleared late in the day, and the evening was beautiful, if windy. As you can see, the marcescent leaves on this American beech tree in my front forest are still hanging on. I'm starting to see buds on a few of the smaller trees and shrubs, so these remnants of 2007 surely don't have long to hang on anymore. Last night the red foxes were barking. I haven't heard them since last fall. The one was very close. The voice of the second had a different sound to it, higher, and was further away. The sound of loons calling and Red-tailed hawks screaming are often mentioned as two sounds that epitomize the wild, but I'm starting to think a fox's barking should be right up there too. The sound sends a chill down my spine. Something about it always sounds urgent, like a frantic alarm call, even though I tell myself it's just their normal communication. It doesn't feel that way to me, though. Standing outside in the dark and hearing the foxes just 50 yards or so away feels as though I am standing in the midst of some invisible danger--not from the foxes, but of something the foxes are reporting to the rest of the forest. They probably consider me the danger, but I share their primal alarm whenever I hear that sound. 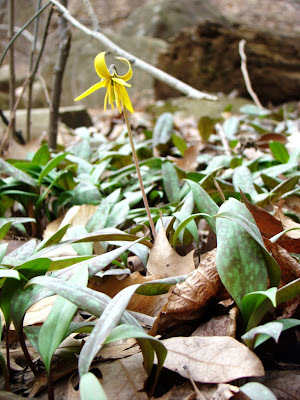 Note: In this area trout lily, dog-toothed violets and yellow violets are all names for the same plant. I hear dog-toothed violet most commonly, though trout lily isn't far behind. This confusion is likely why true plant people use the latin names--no confusion when you use those--but I kind of like the different names. April showers arrived right on schedule here on Roundtop. Overnight a warm spring drizzle has dampened the forest. This morning I stepped outside the cabin and found more evidence of new spring growth than was here just the previous evening. Once spring gets underway, the changes take place rapidly. The tiny mystery seedlings that I photographed yesterday are already perhaps a quarter of an inch higher, though their identity is still a mystery. Here and there I find more greenery starting to poke up through the ground, leaves still whorled tightly. I expect that the next sunny day will bring an explosion of greenery to the mountain. On a day like that, if I spent it sitting outside, I expect I could see almost hourly changes. Last evening I was going through my birding records for March and 2008 so far. Nothing about the number of species I’ve accumulated is unusual—in fact that is all very normal. I’ve had some excellent species during the new year—redpolls are about a once every 10 years kind of visitor here. Siskins and purple finch are more common than that but lately I don’t even see them every year. Every year here on the mountain brings at least a few uncommon species, but there’s no predicting what those species will be. It might be waterfowl or an uncommon warbler or even a shorebird. That’s part of the fun of keeping track of what I see each year. A few species that I haven’t see yet might be evidence of a migration that’s timed, so far, just slightly later than last year. Last year’s migration seemed early to me, so this year’s later arrivals are actually more normally timed, by my records. March 2008 turned out to be slightly cooler than average overall, a result that gets rarer with each year. So I’m not complaining about what haven’t seen yet, just noting the timing. In my photo this morning the woods outside the cabin looks a bit dreary. It didn't feel dreary to me. The dampness deadens my footfall through the leaves, and the rising hill draws me towards it. I would have liked to spend the day wandering through these woods. But today duty calls and work awaits.